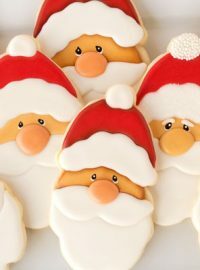 I know, I know, you just saw some cookies like these the other day. 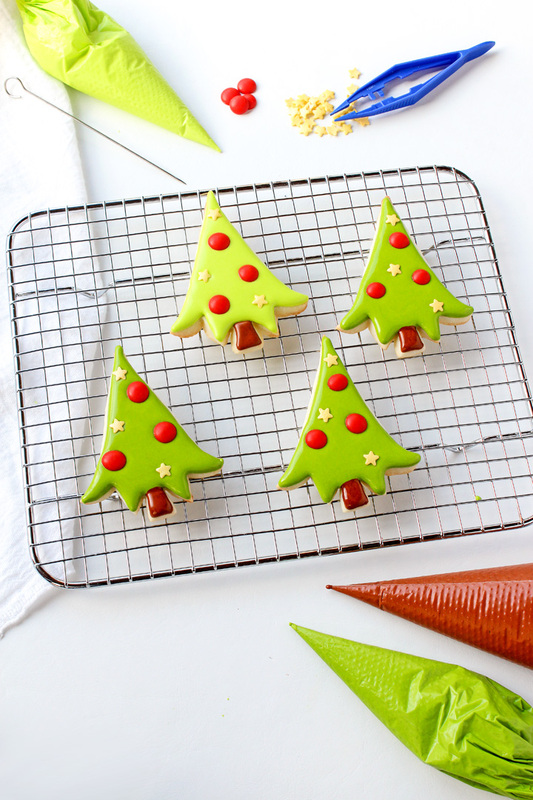 I made some Christmas Wreath Cookies that look an awful lot like these Christmas Tree Cookies, but I did it on purpose. 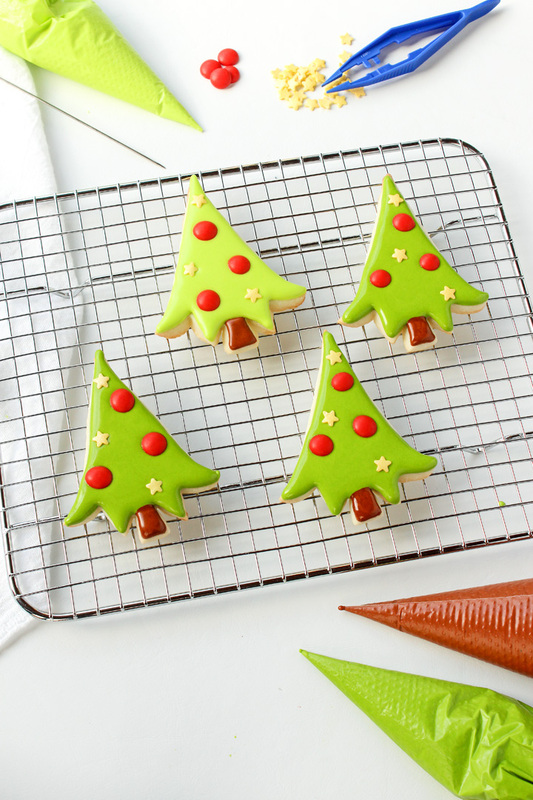 You see, I’m working on a little project I’m going to share with you, but before I can do that, I needed to show you these Christmas Tree Cookies. That kind of makes the project sound like it’s hard or complicated, but it’s not. This isn’t one of those deals where there are a million cookies involved or you need a roadmap to get you through it. Nope. It’s easy but the right cookies are important so let’s learn what we need. 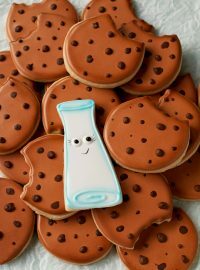 Even if you decide not to make the cookie project with me, you can still make these cookies on their own. They’re cute either way. 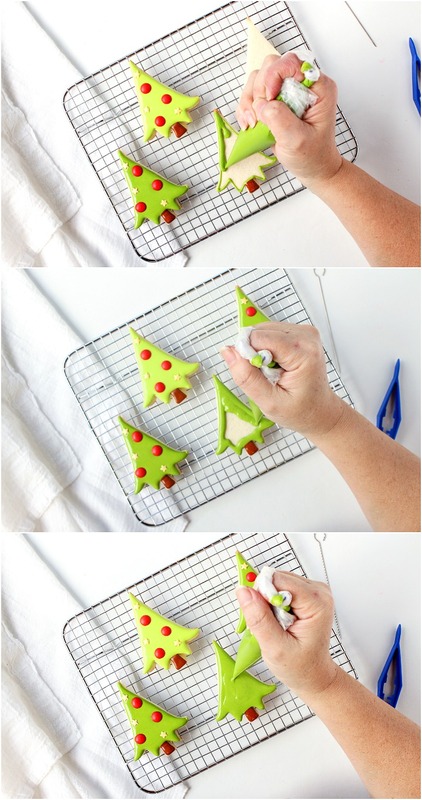 LilaLoa’s Christmas Tree Cookie Cutter from Whisked Away Cookie Cutters – I made these with the 3 1⁄2″ x 2 5⁄8″ cutter. I used Americolor Soft Paste Food Gel Colors – Use Lime Green or make a Darker Lime Green by adding a little Avacado. Eyes-Medium-and-Large – Red Ornaments for your trees. If you need more info click here. You need to make these a few days before you make the trees. I usually make a lot of these in October with the leftover royal icing because they are great little helpers for your cookies. Once you make them, let them dry completely before you remove them from the wax paper. Store them in a dry airtight container away from the sun. 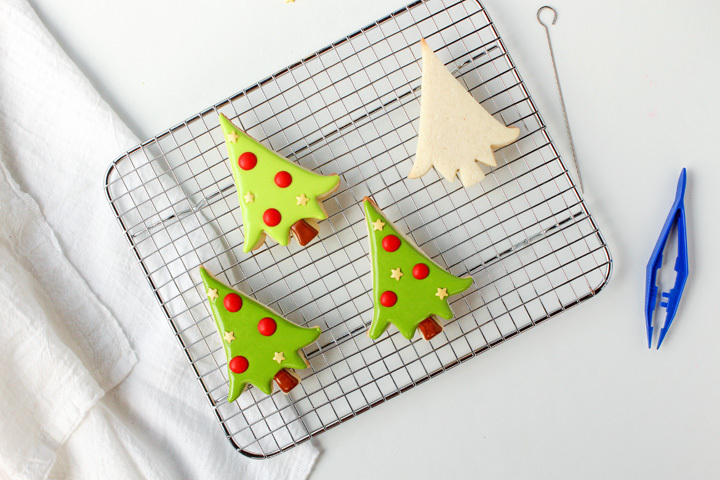 Make the sugar cookie dough and then cut out and bake your Christmas tree cookies. Let the cookies cool completely before you begin to decorate. Make a batch of royal icing. Color some of it green and a small amount brown. Place them in the tipless piping bags and grab your shimmer star sprinkles and the red royal icing ornaments and get ready to decorate. 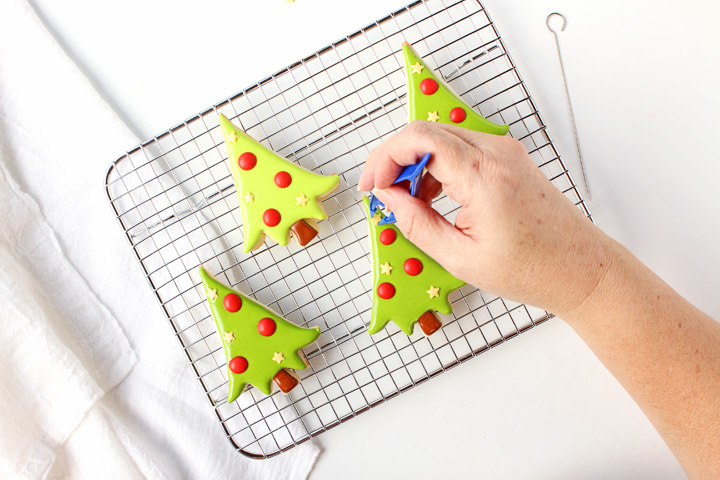 Outline the top of the tree with the green royal icing. Flood the tree trunk with the brown royal icing. Next, flood the tree body with the green royal icing. Use the turkey lacer to pop any air bubbles. While the icing is wet, add the ornaments. Then add the shimmer stars. 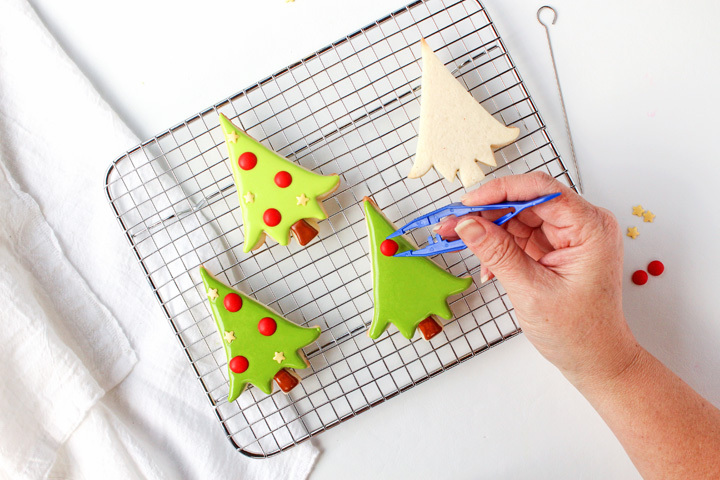 Using a pair of food safe tweezers or tongs will help make decorating your tree a little easier. 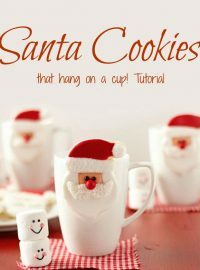 Let the icing dry completely before you stack or package the cookies. I know we used the same techniques as we used to make the Christmas Wreath Cookies a few days ago. 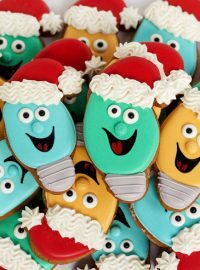 Both sets of cookies are cute on their own and they’d be just as adorable if you made them with different colors. Don’t forget to make some fun colored circle to use on your cookies. Circles are just for eyes anymore. I encourage you to make some of the(the template can be found here – Candy Eyes) for your cookies. Seriously, they’re great for cookie decorations and a great way to use your leftover royal icing. Stay tuned for the project where you can see these two cookies come together! I think you’re going to like it. Get the Skills to Decorate like a PRO! Master Royal Icing Consistency. Learn tips & tricks that actually work. Don't wait...let's create and grow your skills each week! Success! Now check your email to confirm your subscription so we can 'bake' the world a better place! Completely adorable, I just love the shape of the tree! I love the shape and color of these trees; they are so cheerful! I love coming to your blog, Lisa! The photos are always so gorgeous and it’s such a happy place! I need to get back to my blog, and revamp, in 2018! These are absolutely darling and thank you so much for the mention! 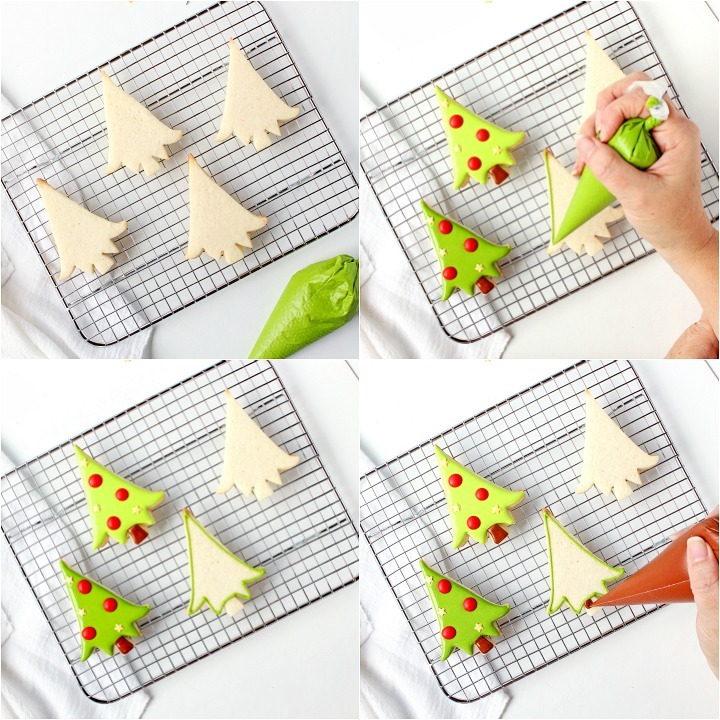 I just love these and it is such a fun idea to do with kids too! I can’t wait to see the project that you have planned for them! Thank you again! 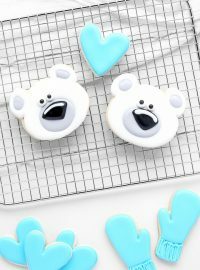 I am The Bearfoot Baker and I want to show you how to create fun and exciting things in the comfort of your own kitchen. I hope you find things that inspire your love of baking and inspire your creativity! Don't wait...let's create! Grow your skills each week! ©2019 The Bearfoot Baker. Design by Purr.